Jos Buttler said his record-breaking century in England's one-day win over Pakistan was "a long time coming". The wicketkeeper hit England's fastest one-day hundred, off 46 balls, in Dubai three weeks after being dropped from the Test side. 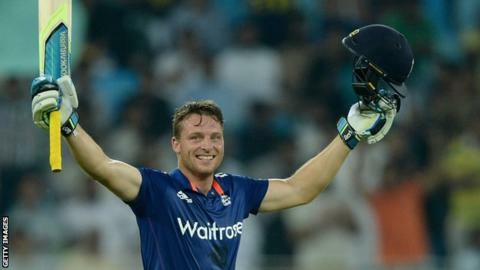 Buttler finished with 116 not out off 52 balls as the tourists won the fourth ODI by 84 runs to take the series 3-1. "I got dropped at this ground, so to come back and have a good day here is really satisfying," he told BBC Sport. "You sit there and wonder why today it's clicked. You still train the same whether you get runs or you don't. "If I knew the answer I'd be a lot more consistent." Buttler has now scored the three fastest one-day hundreds for England, after a 61-ball effort against Sri Lanka at Lord's in 2014 and a 66-ball ton against New Zealand in June. That innings at Edgbaston was the last time he reached 50 in international cricket, a run which led to his omission for the final Test. Buttler, who made an unbeaten 49 to help seal victory in the third ODI, was promoted two places up the order to number four by captain Eoin Morgan in Dubai. Buttler said: "Just as I got my pads on, there was a wicket, so I was straight out there - no time to think about it, just go and play and that confidence the captain has given me has fallen over into the innings." Buttler went from 50 to 100 in only 16 deliveries, and struck 10 fours and eight sixes in total. Morgan told BBC Sport: "I said before he went out that he's the only one of us who can score a 60-ball hundred, and he's done it in 46. "We watch him do it in training week in, week out. It was an unbelievable innings." England amassed 355-5, featuring Jason Roy's 102 - his maiden international century - and 71 from Joe Root - before bowling Pakistan out for 271 with 9.2 overs unused. Victory secured only their third one-day series win since February 2013, but Morgan said England were "a long way off perfection". He said: "With the ball, we've a lot to work with, and tonight summed that up - we continued to take wickets but couldn't stem the flow of runs. "We've learned a great deal, and the most satisfying thing is that we're winning along the way." England coach Trevor Bayliss said Buttler's innings was one of the best he had witnessed. "I'm not sure if I've got the words to describe it," said the Australian. "There was some very clean hitting, no slogging, good cricket shots, and shots not necessarily in the coaching manual." Bayliss, on his first overseas tour since being appointed in May, was also delighted with how they turned the series round after heavy defeat in the opening match. "To come back shows not just the skill but the character this team has as well," he said. "But they've still got some improvement in them, which is a good thing. "Their skills are starting to show on a more consistent basis. "I'm sure this young group of players will have their bad days; we saw that in the first game of the series. As time goes by, that consistency will get better." Is the 'perfect' 17-ball hundred possible? Read more on Is the 'perfect' 17-ball hundred possible?